Our Yellow Turmeric is available in both finger and powdered form. 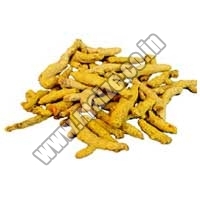 The Yellow Turmeric Powder made available by us is commonly utilized as flavoring agent, medicine and dye. They have pungent smell with bitter taste. They are used in various food stuffs for adding color and flavor in them. Besides, we are one of the prime Yellow Spice Turmeric Exporters as well as suppliers in the market.